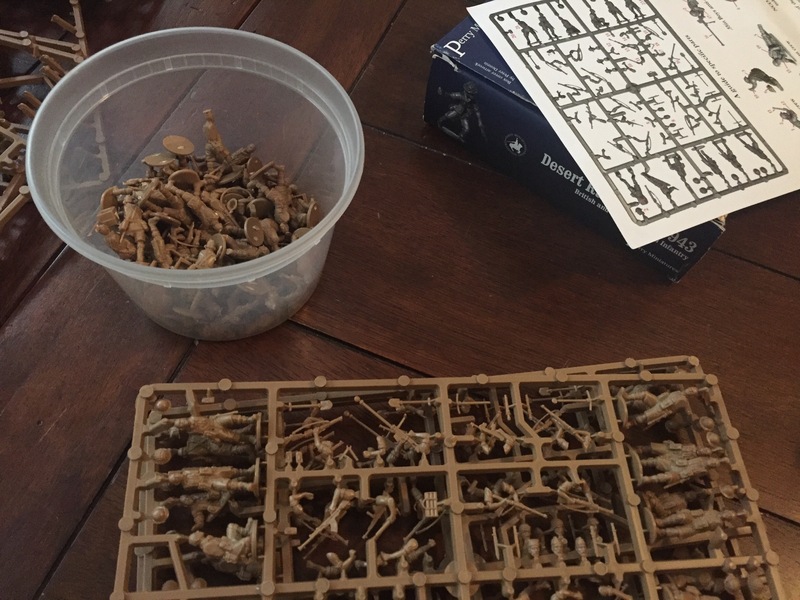 Little Green Monsters – Xenite's Miniatures Page – A blog about gaming, sculpting, and painting. I’ve been working on my 30k Blood Angels for an upcoming event. Here are some Work in Progress shots. I’ve been cranking on terrain and my 30k Blood Angels for a Horus Heresy event that we are running this summer. 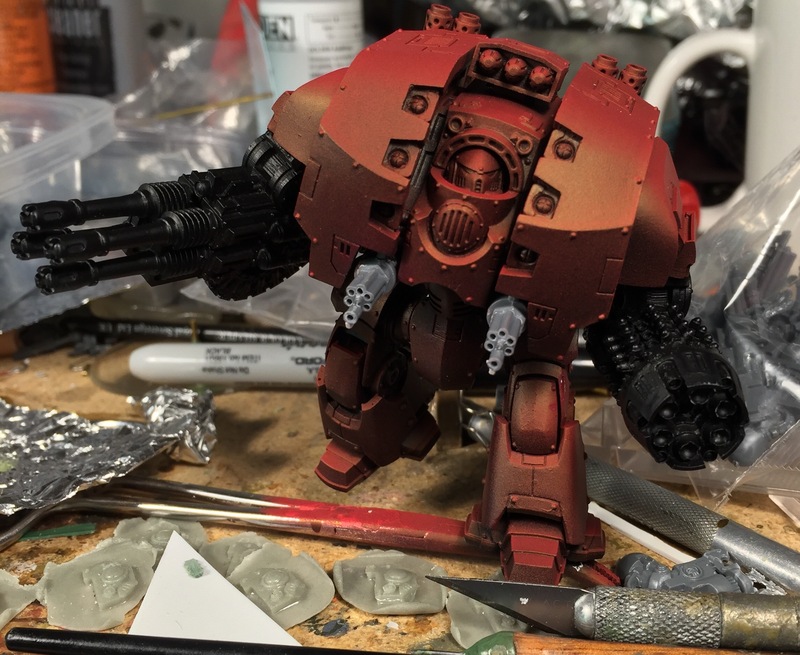 Part of this project was referenced in my prior posts about modifying the BaC Contemptor Dreadnought. 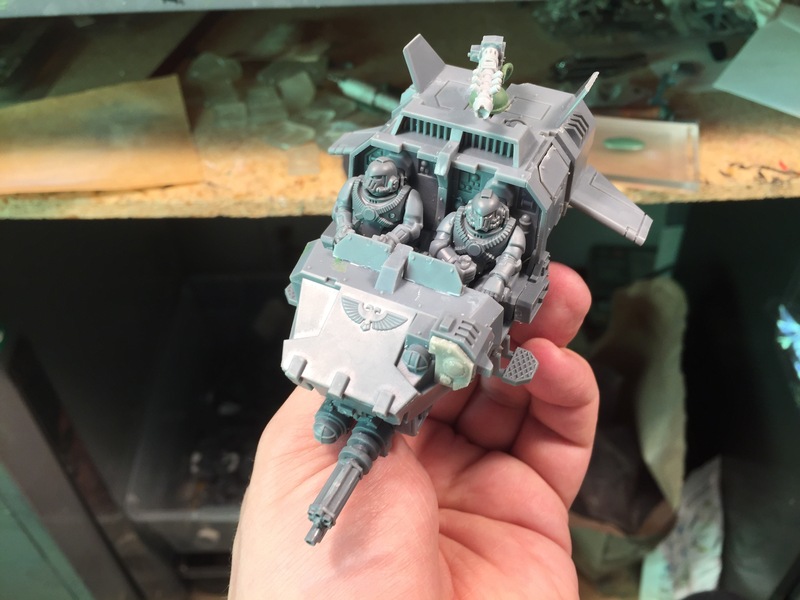 Originally my goal was to do an Orbital Strike drop-pod list, I still want to run that occasionally but I have decided to change directions slightly and do a ‘Day of Revelation’ Assault Marine list instead. It’s a more compact project which still involves several drop pods. Here are some work in progress shots of the units I’ve been working on. 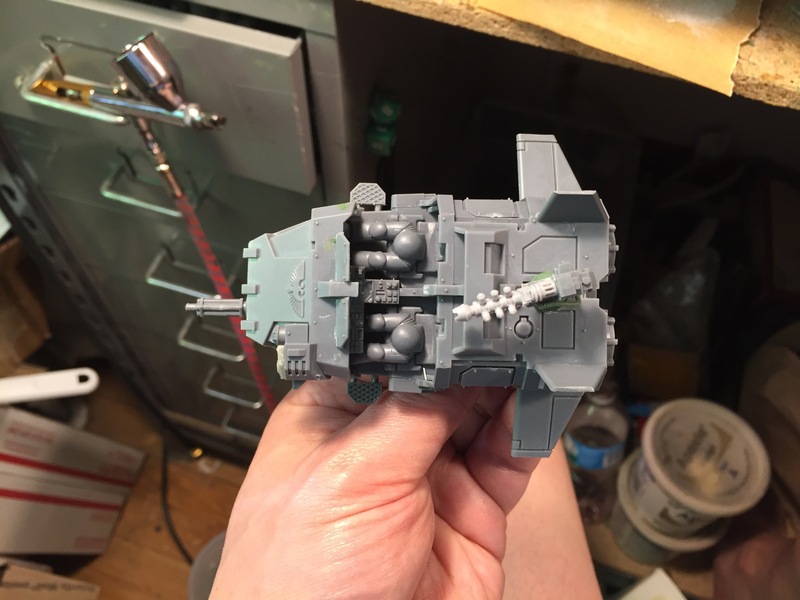 Leviathan – I recently plucked the heavy Flamers off of the model and replaced them with Iliastus Assault Cannons. You can see some landspeeder press mold bits in the foreground. One of several jetbikes – I have about 9 of these, several will be dedicated to characters. Landspeeder Squadron – 5 speeder squadron is underway. The graviton gun on the top is controlled remotely by the gunner in the right hand seat. Jetbike Chaplain – This is one of the characters who will be riding around, causing trouble, in my jetbike squad. Most of this fits into my new list.everything has a pile of work to do yet, but I wanted to share some of the work in progress. Once I get my assault marines all buttoned up they will join these units on the paint bench. 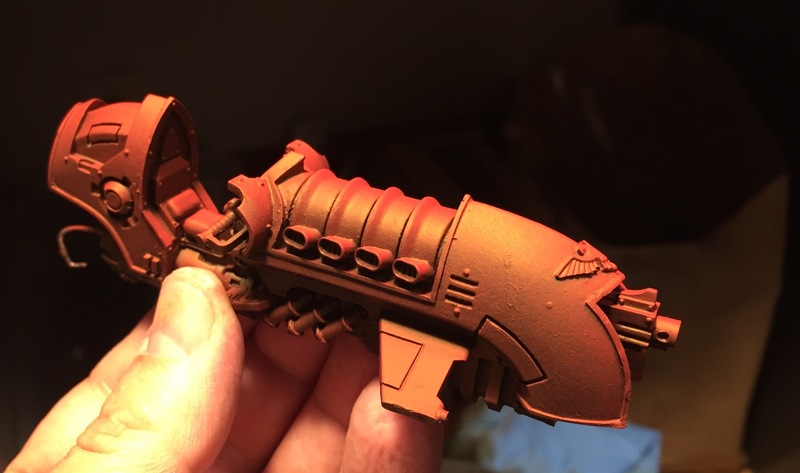 This dreadnought is nearing a point where I can start priming him. I’ve positioned the legs, added the final layers of detail (a few bits missing yet), and have completed his two plasma-blaster dread CCW arms. The body received a bit of extra detail here and there. My goal is to have each of my dreadnoughts be fairly unique with little details that help define their individual character and some of their story. This one has some field repairs done on the outside of his carapace, a rerouted supplemental power feed or something. Detailing and leg pose on the dread’s torso. Some additional detail added to his hip and to the waist to help cover the mounting points. I was inspired by the level of detail on the Forgeworld resin dreadnoughts. Get back to work Mike. The arms of this dreadnought were an area where I wanted to hide some additional details. The idea here is that there are power feeds to his massive, weaponized arms. I like these being tucked under the arms a bit so that they are immediately noticeable. I like the idea that these details are there for someone who really studies the model. Plasma blaster made from a 40k era plasmagun hidden in fist. Once I get the parts completed and primed I am going to bust out the airbrush and some red paint! I’ll finish assembly once the basecoat and much of the detailing is complete. 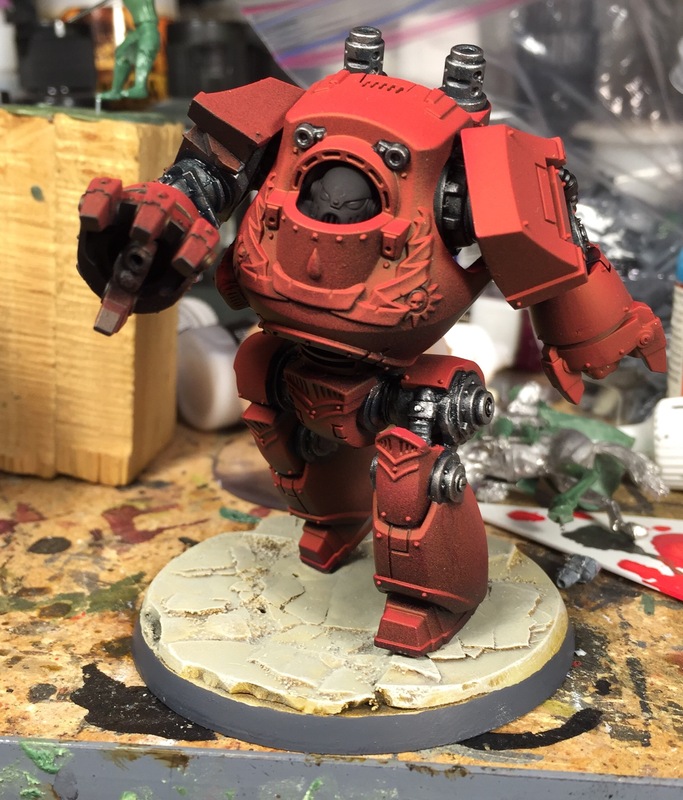 Part one of a short series showing the Contemptor Dreadnought from Betrayal at Calth being converted. 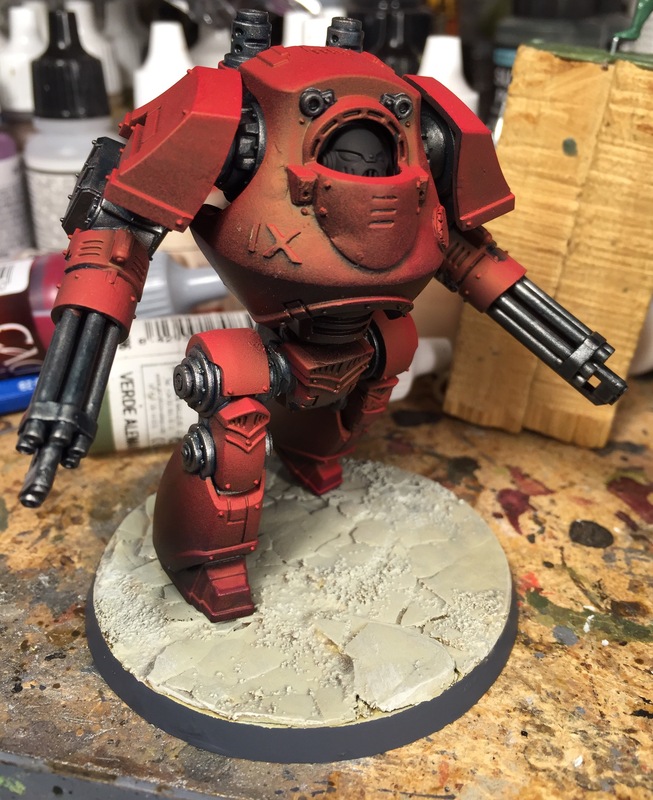 I’ve been collecting several of the of the Betrayal at Calth dreadnoughts to add to my Blood Angels force. The models in this set are fantastic, but the dreadnought’s pose is a little flat. I am going to reposition them to varying degrees, primarily the legs the head and the torso. This opens up a lot of dynamic options for the model. The first dreadnought is going to receive some significant leg work. Others will likely have more simple repositioning. This one is going to have a remodeled middle leg. Changing the position of the head on this kit is pretty easy. Once its been removed from the liner part of the torso and trimmed it can be pivoted slightly to bring a lot out of the torso’s upper body. Even a little bit of repositioning of the dreadnought’s head will make the torso’s position a lot more interesting. Next up its time to chop up the legs. I am discarding the knee and middle leg. The plan is to rebuild these out of plasticard and putty. Using some greenstuff putty the cavity inside the trimmed lower legs are filled in. This will provide a solid foundation for the rest of the legs to built on. The contemptor dreadnought’s arms are convenient in that they are symmetrical making it very easy to create a left and right arm from the close combat weapon arm from 2 separate kits. Other dreadnoughts will have different load-outs that I can assemble later. Using a small amount of glue I did a test pose for the upper torso. This begins to capture the aggressive pose that I am going for with this model. Stay tuned for the next part of this project! I’ve been bitten by the 30k bug since the release of the Betrayal at Calth box set. I’ve wanted to do a Horus Heresy army for years but found the FW prices & shipping to be a barrier to entry. The models provided in the set are excellent and are perfect for a conversion junky such as myself. GW did a nice job of keeping the models simple and well designed. They mesh perfectly with the FW resins as well as the GW 40k marines and have a refreshing lack of random adornment (Purity Seals… blech). My first group of Astartes for this project is a 15 man block of Tactical marines in a mix of Mk 3 and Mk 4 armor, a similar 10 man block, and Plasma-gun and flamer wielding Tactical Support squads. 2 Plasma Support Marines. I need to finish up the commander’s pointing hand. Close up of a Tac Support Marine. You can see my basing plan with this shot. After I complete these guys I am going to hack up the Contemptor Dreadnought for some re-posing! Stay tuned. With another Operation Sting in the bag, I’m finding myself very motivated to work on minis for that system. The Soviet Scout army is coming along well and there are more Russians on the way in the form of a Tankovy company (more on that soon). In addition to the Soviets, I’m getting into an Australian 9th Division army project. 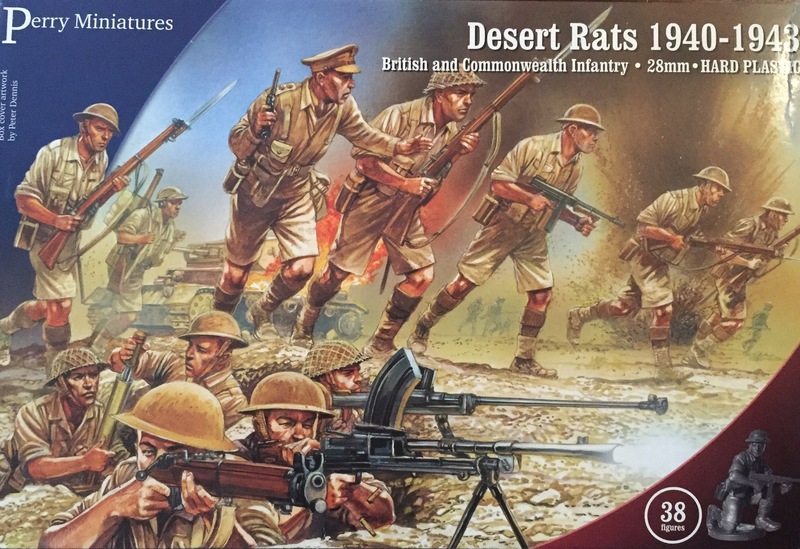 I’m basing this project around the Perry Brothers plastic Desert Rats kit. These minis are the first plastics from the Perrys that I’ve worked with and so far it seems to be a cool kit! This is a very detailed kit which may be a bit of a challenge for those intimidated by those who aren’t very much into the modelling aspects of this hobby. This feels like a scale model kit more than wargamining miniatures due to the vast amount of parts which come on each sprue. Luckily I’m into this sort of thing. I did lots of models groing up befor getti g into gaming and I appreciate the Perrys for their attention to detail and craft with this kit. Loads of options in terms of gear and even some alternative heads for making LRDG or SAS figures. 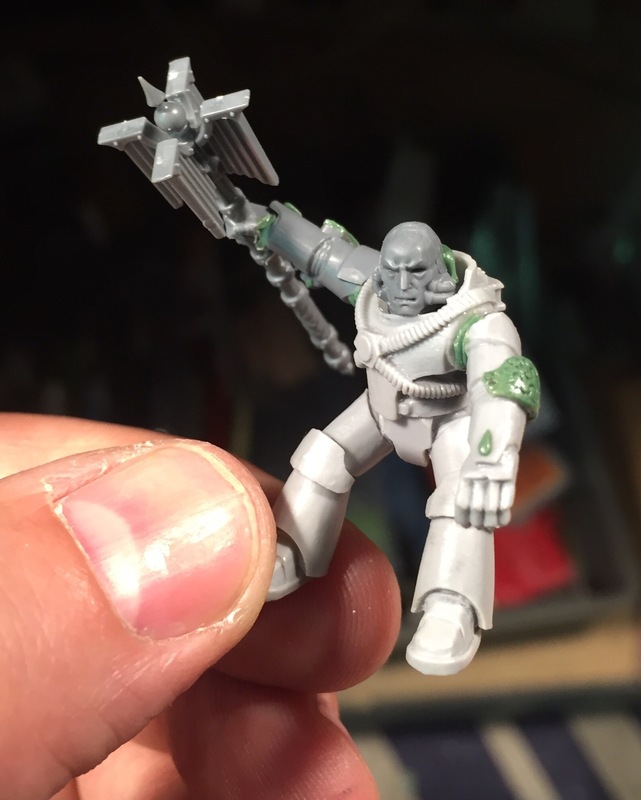 This headswap requires some cutting, but it shouldnt be much of a challenge for most hobbyists. Shown above is my sprue processing system in action… not much of a system; clip thing, find where it rocketed to the floor, put in tub to be cleaned later. One interesting bit to these minis is their independant helmets & hats. That is something of a unique attribute to these minis, and one which works for me as I’m intending to slap some Aussie brimmed hats on some of these guys. 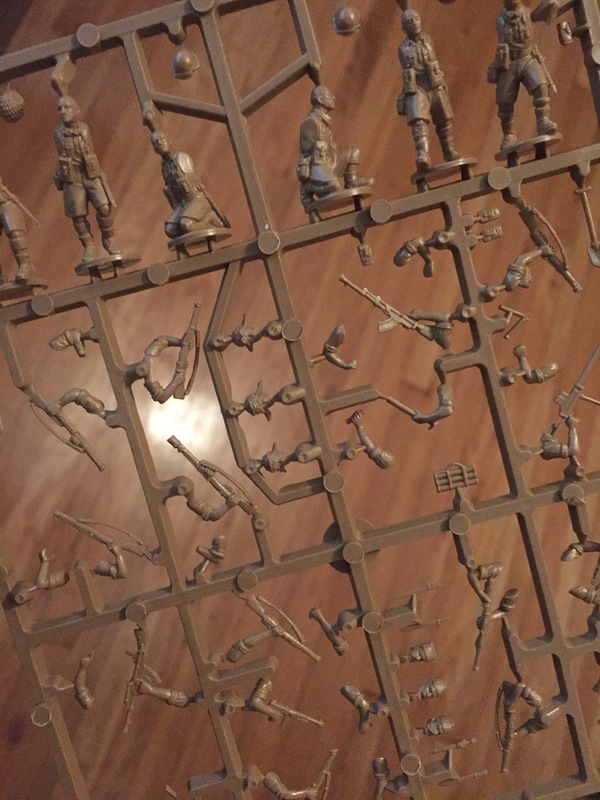 Getting these guys prepped is the bext step then its back to doing some final paintin on the Soviets as well as some sculpting. I’ll share some more pics over the weekend!